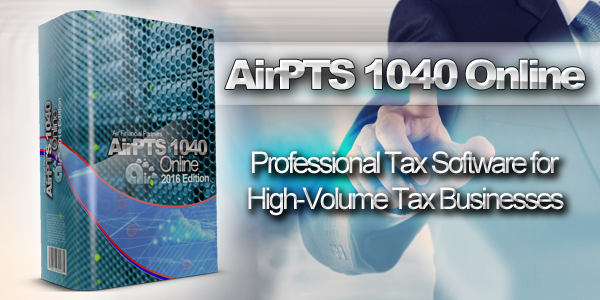 AirPTS 1040 Online is backed by the industry's leading Online professional tax software solution for high-volume tax businesses. Built based on the needs of busy tax offices that specialize in providing their taxpayer clients with fast and accurate tax returns, AirPTS 1040 Online has been a trusted software solution since 2016. With industry-leading tools such as Point-and-Shoot Error Correction™, exclusive TextLink™ integrated text messaging technology, and support for electronic signature pads and hand-held W-2 barcode scanners, AirPTS 1040 Online software users are able to process tax returns more quickly and accurately. AirPTS Multi-Site Online provides the industry's only 100% web-based online professional tax preparation software solution for multi-site deployments. AirPTS Multi-Site Online professional tax software does not require any software downloads, hardware support, or other costly requirements. Rather, all you and your remote tax preparation locations need is an Internet connection and a web browser. With the most complete sets of Federal, State and City tax forms available; and built-in verification features to help eliminate IRS rejects, AirPTS Multi-Site Online professional tax preparation software makes e-Filing of Federal and State tax returns a simple process that even the most novice of professional tax preparers can easily use. AirPTS Multi-Site Online tax software enables you to expand quickly and manage remote tax preparation locations easily. AirPTS Multi-Site Online professional tax software recognizes that your business, logo and brand have value. The easiest, most convenient, and most reliable solution for deploying professional tax preparation software to novice tax preparers in multiple tax office locations—all via a single click of the mouse.